Roger A. DeHart received a BS in Biology from Seattle Pacific University in 1976, and completed course work toward a Master of Science in Education from University of Tennessee, Chattanooga, TN. He has taught biology for almost 30 years, with 20 of those years being in public schools. For much of his career, he introduced challenges to Darwinism and the concept of intelligent design in his high school classes. DeHart assigned his students excerpts from the creationist supplemental biology textbook Of Pandas and People, he would also show the film Inherit the Wind, and draw upon articles from science journals that challenged evolution as a way of having students question evolutionary presuppositions. 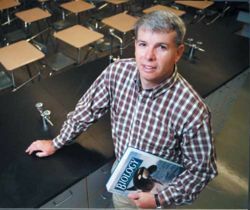 He was the high school biology teacher at Burlington-Edison High School in Washington State for 14 years, when in June 1997 a parent of one of DeHart's students sent a complaint to the American Civil Liberties Union. The ACLU quickly threatened to sue the Burlington-Edison School District if DeHart didn't stop teaching intelligent design. In response to the threats of impending lawsuit, the district took away the biology classes from his teaching load, and he was reassigned to earth sciences. DeHart later resigned and took a teaching job at Marysville Pilchuck High School where he taught for one year. He then transferred to Oaks Christian School located just outside Malibu, California where he taught Honors and AP Biology. Mr. DeHart currently resides in Florida. This event brought forth national attention and controversy, including Sunday front page coverage in the Los Angeles Times. In response to media exposure, support groups for both sides were formed (i.e BECSE). His story also became the feature of the video Icons of Evolution. "I'd always thought that there was two sides to the debate," says DeHart, "and biology textbooks present one side. And I was confident at the time there were other scientists who came to other conclusions. I realized that talk of God and the Bible and things like that was not science, was not part of my class. But on the other hand, I think there was evidence of design." Icons of Evolution (video) Features the story of Roger DeHart. Origins of life film to premiere at SPU The Falcon News. Seattle Pacific University. May, 8 2002. Intelligent Design in the Classroom Interview with DeHart on American Public Media. This page was last modified on 19 June 2010, at 10:26.